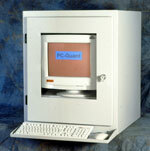 PC enclosures to protect PC and computer hardware in industrial and commercial applications, ensuring security of computer and electronic equipment. PC Guard have a range of high quality PC enclosures to suit many industrial and commercial applications from enclosures to Industrial waterproof stainless steel PC enclosures sealed to IP65. Our experience has been the basis for the development of our own products and the development of PC enclosures to suit our customer's requirement and budget. 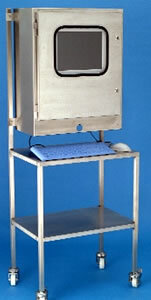  Optional stand for printer either enclosed or open.  Lockable door front and back for security and easy access. When designing the PC enclosures we looked at what customers really needed and designed manufacturing cost out so that we could drive the price down, achieving a better price for you. Protect Standard PC's in hostile environments. ï¿½ Rubber keyboard and mouse sealed to IP65 included in the price. ï¿½ Uses standard desktop or tower PC's. You can use your current corporate standard PC and your current maintenance company. ï¿½ The cost effective way to use computers in the food and pharmaceutical industries. ï¿½ Upgrade your computers in the future without having to change your PC protection. ï¿½ Manufactured from 316 Stainless Steel.